On the Terrace of the Savior-on-High, to the right of the entrance is the Catherdral of the Image of the Savior Painted Without Hands Behind the Golden Grill. Tsar Mikhail Fyodorovich had this built in 1635-1636 and the same time as the three floors of the Terems, exactly underneath the Golden Hall of the Tsarina. The architects who took part in the construction were also those who built the Terems: Bazhen Ogurtsov, Trefile Sharutine, Antip Konstantinov and larion Uchakov. 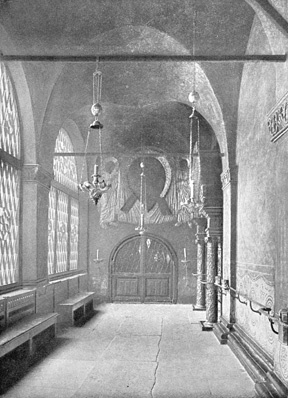 The Cathedral had an altar dedicated to St. John of Byelgorod, which was soon re-dedicated to St. John the Precurser under Tsar Alexei Mikhailovich. During the reign of Fyodor Alexeievich the Cathedral was restored. 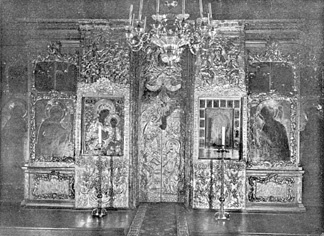 The engraved silver iconostase, the Holy Door and altar were a gift of M.P. Saltikov in the 18th century. The Cathedral of the Savior-on-High was the closest to the personal apartments of the Tsars, and took the same importance with regard to their religious devotions which had previously been that of the Cathedral of the Annunciation. The Tsars Mikhail Fyodorovich, Alexei Mikhailovich and Fyodor Alexeievich took communion here often. In 1903, Their Imperial Majesties Emperor Nicholas and Empress Alexandra Fyodorovna attended services here for Holy Thursday and the morning service for Easter.